The Bedford Falls Sentinel - An It's a Wonderful Life Blog: It's a Wonderful infiltration of communist propoganda? Will the deliberately maligned of Bedford Falls please stand up. It's a Wonderful infiltration of communist propoganda? Will the deliberately maligned of Bedford Falls please stand up. 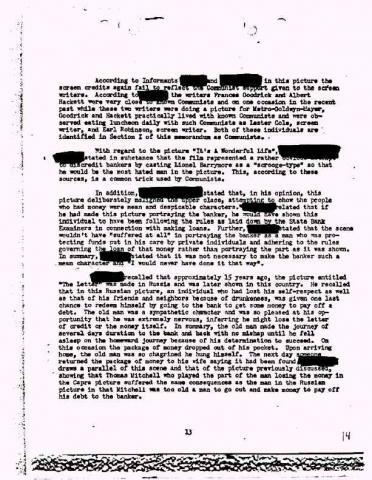 As just a side story, and something many have probably already read or caught a blurb or two about over the past few years, Capra and his film were investigated by the FBI concerning ongoing worries over the COMMUNIST INFILTRATION OF THE MOTION PICTURE INDUSTRY factor through the late 40's and heavily into the next decade. Without getting into politics over the methods or intentions let alone any comments over justification I simply wanted to post images and a transcription of the famous memo that was sent concerning our beloved film. First the memo itself. It's hard to read, so I've linked a story that does type out what is actually mentioned in the note. 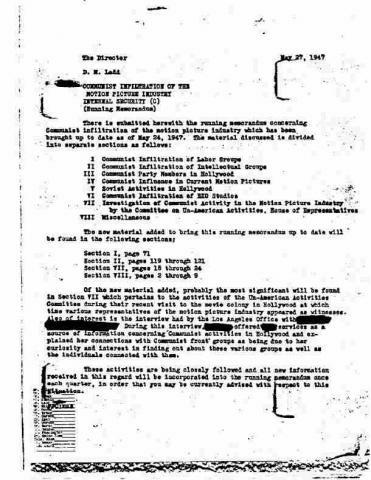 If you don't feel up to reading the entire thing it can be summed up that the memo has concerns over the film "deliberately maligned the upper class, attempting to show the people who had money were mean and despicable characters" and "attempts to discredit bankers" which is listed as "a common trick used by Communists". Now as someone who watched the film well before any such ideology or political hints could have been understood and felt, I feel that I can say that none of those sentiments were in my early feelings concerning the film and certainly not now even though I do actually find myself calling out director or studio cheap shots for some of the modern movies I see (as my wife can attest and is continually is annoyed by I might add). The story is about George, and the only significance money has in the film is to show that ultimately it's not that which makes us rich. The banker might be the bad guy, but he's bad because of his attitude concerning people not because he's rich. George doesn't represent the poor masses or some kind of hints at a populous commune, he represents the all American middle class just as most of the town characters do. For some reason I just don't have a feeling that Bedford Falls was full of Reds. For anyone who enjoys the film, the ending feeling and emotion exudes an experience almost and when Harry raises his hand for that last toast ... the very last thing in your mind is going to be something this memo is talking about. To quote George, that last scene IS the film in a nutshell and forces a feeling that is indescribable every time I watch it. "You're talking about something you can't get your fingers on"